Staff know the children well and meet their learning needs effectively by drawing on their interests and skills. The quality of teaching is good. The successful partnership with other professionals helps staff to work well with outside agencies to obtain support for children when needed. Staff understand and respect the needs of all children. All children thrive as they play and learn together. Leaders make sure that the staff team works well together. The manager checks that staff understand their roles and responsibilities well and are well positioned in the nursery to meet children’s care needs effectively. Staff have good partnerships with parents. Good sharing of information means parents know about their children’s daily activities and are included in supporting their learning. Children make good progress in their learning. They have access to a wide range of activities based on their needs and interests. Children are well prepared for their next stage of learning and gain many key skills they need for the future. Children are happy and confident. Staff are kind, caring and warm towards children, who settle quickly in their new environment. Leaders are ambitious and have a strong drive for continuous improvements. They reflect in detail on the service they provide, including the views of others, to ensure children receive good-quality education. Partnerships with parents and other professionals are strong, and staff value the importance of helping to provide consistency in children’s experiences. Children develop strong attention skills and enjoy listening to stories. For example, they join in excitedly when reading ‘The Very Hungry Caterpillar’, doing the actions. 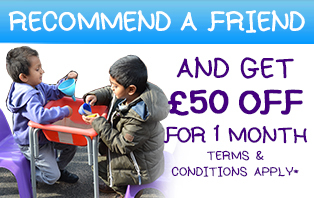 Children behave well at all times and learn to form friendships with others. Staff are consistently good role models and children value and respect each other.